Pollen gotcha down? 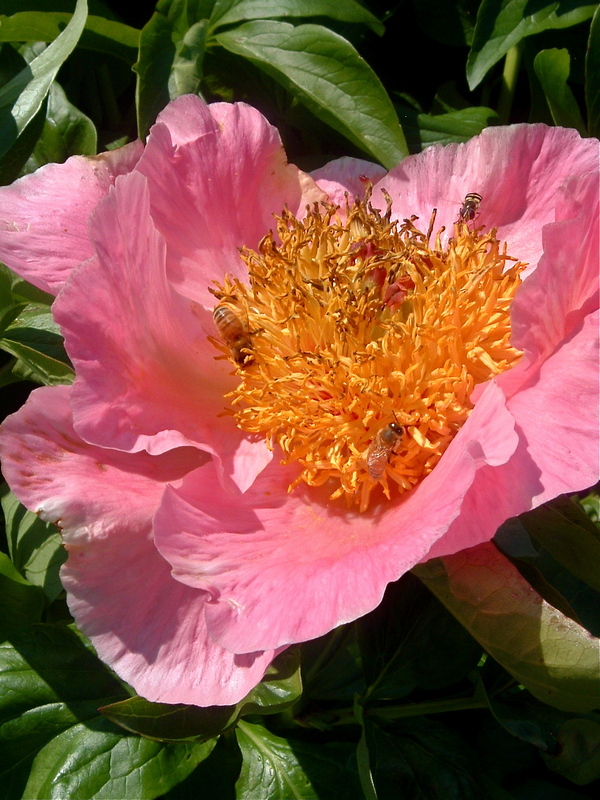 We’ve been a little sneezy, but my allergies are nothing compared to what they were in Orange County. I’m allergic to smog more than anything else, and it’s much worse now that I don’t spend much time in cities. But who cares about smog when you’re in Eugene and it’s 85 degrees and you’ve got an exploding garden yearning to fruit up and flourish? My peas shot up overnight, going from blossom to full-size snow pea in one day. My eight pepper plants are happy in their new hot bed on the south side of the house. My tomatoes are going crazy and the raspberries and blackcaps all have little berries on them. I’ve got eight little artichokes poking their heads out of the leaves, and a few pints of strawberries on the verge of ripening. The only things that aren’t doing well are one rhubarb (surprisingly a Victoria, which is supposed to do well here) and the chioggia beets. Oh well. And I’m a little mad at myself for inexplicably losing my tin with all my seeds from 2008, including heirloom beans and my cucumbers. Grr. My haskap (blue honeysuckle) berry hedge is doing well. I think I lost one of the six plants, but I’m still hoping for the best. They were a bit chomped on when I planted them, but they took to the soil well and are flourishing. You can see some of the leaf damage and the little unripe berries. My dahlias are coming up and I have two calla lily flowers for the first time ever. I’m headed back to Buffalo to finish my research fellowship and give a conference paper, so keep your fingers crossed for my garden. See y’all soon! Mexican food in Eugene is not the greatest of our culinary problems, but you still can do well by yourself making delicious Mexican food at home. The next Master Food Preservers class is this Saturday, May 30, from 9-3 at the Extension building. For a mere $30 you will have a full day of instruction and lunch with Alejandra Bernal de Mendez, a Jalísco native, and the Master Food Preservers. This class has been in preparation for months, and I would strongly urge you to take it if you have any interest in learning how to cook Mexican food. I haven’t been involved in the planning, but I understand that dishes to be made include a regional enchilada, tamales, and a tres leches (moist, milky caramel) cake. I think they also are planning to teach simple cheese-making (queso fresco). Give a call asap to reserve your spot and let the instructors know how many people to expect. More information about registration is available here. Please note this class is the last for the summer, as the June dehydration class has been changed to a Down to Earth demo. I also wanted to remind everyone that June 1 is the postmark date for strawberry orders through the Emerald Empire Kiwanis Club. 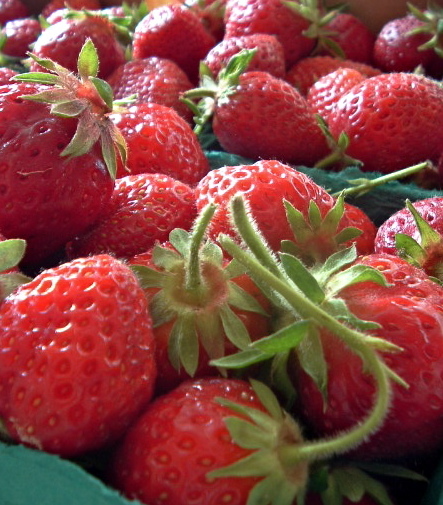 This charitable organization arranges for local strawberry picking, cleaning, slicing, and delivery to Eugene. It’s the easiest way to get fresh strawberries in season that are ready to be used in all your fresh desserts, transformed into scrumptious jams, or frozen for use all year ’round. The proceeds go to local charities and programs that help children. Deliveries are made to Valley River Center on June 18, and you can pre-purchase 15- or 30-lb. pails. Frozen blueberries, strawberries, and marionberries (for pickup in August) can also be ordered at this time. Hope everyone had an excellent, sunny, warm Memorial Day weekend. I was gardening for most of it, but I did take an eensy weensy bit of time to cook for a bbq and gift-giving. 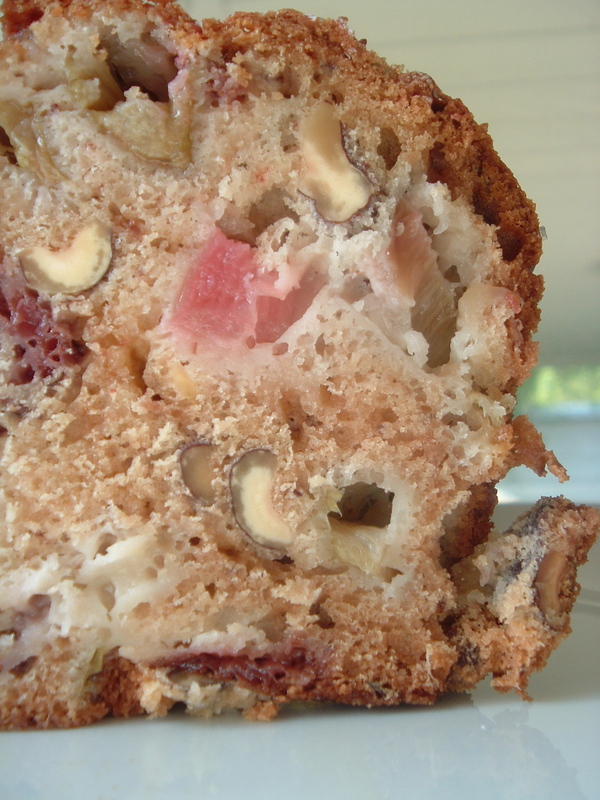 I made a new rhubarb bread recipe (from BaltimOregon’s recipe clipping files) over the weekend to give to neighbors. We have new neighbors to the west, and the best neighbors ever to the east. These events deserve some rhubarb bread, don’t you think? This makes a light, not-very-sweet loaf of quick bread. The rhubarb gets mushy, even coated with flour, so you want to chop the pieces small. I wonder if making a puree from the sugar, then incorporating it in the batter, would infuse the bread with more rhubarb flavor. I substituted hazelnuts for what is probably generally walnuts, reducing the oil in the bread, so it was a bit cakey and less like a quick bread than usual. Roasted hazelnuts would have been better than raw, oh well. Didn’t have orange zest, so I substituted a bit of lemon oil and about a 1/4 cup of local strawberry freezer jam that I had on hand, both of which lent nuances in flavor. Used local Victoria rhubarb, the green and pink-stalked stuff, so the pink is mostly from the strawberries. I think I’d throw a handful of millet in the batter next time, since I really like the crunch in quick breads, and use some whole wheat flour for more depth in texture. Just wanted to take a moment to say how much I love being home. Could the merry month of May be better? I’ve never been happier than in Oregon in late spring. The Master Food Preserver canning demo at Down to Earth yesterday went well. I had a small group of students — newbies to canning all — who sat through the entire demo, so it ended up being more of a 2-hour lecture than a Q & A period. I was happy to teach what they wanted to learn! Then there were more people before and after who stopped by to talk to me and pick up handouts on everything from canning equipment to low-sugar jams/jellies to a strawberry-rhubarb preserves recipe to pie fillings. The Down to Earth people couldn’t be nicer, and they created a great display and teaching space in the north enclosed porch area. You should definitely come check it out. I’ll announce the next class (which will be taught by another MFP volunteer) as soon as I can. Surely because of my fame, as evidenced by activities such as the above, I was featured on TV the other day. All right, it was just part of my face, my hair, and my arm, but I want you all to know that was me in the corner at Bar 201 on KVAL’s 11 pm news on Friday. We enjoyed a few of Rico’s new drinks before heading over to the grand reopening of Café Zenon, which has done a really nice job in sound-abatement for the restaurant. The space has a lovely feel to it. But all is not fun, drinks, restaurants, teaching, and games. 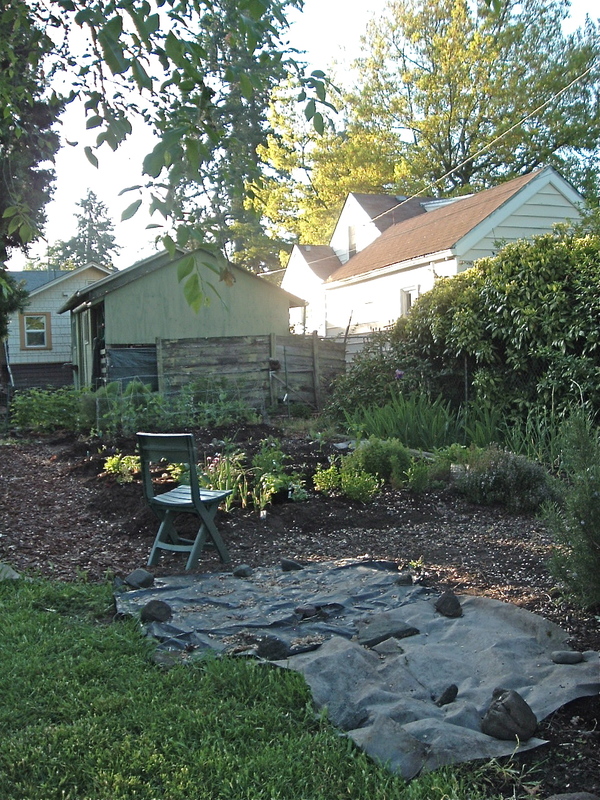 In the past three weeks, I’ve devoted many hours to the garden, preparing for the crops to come. The front of my house has been rather neglected since we moved in, as I learn more about landscaping, hardy plants and natives. 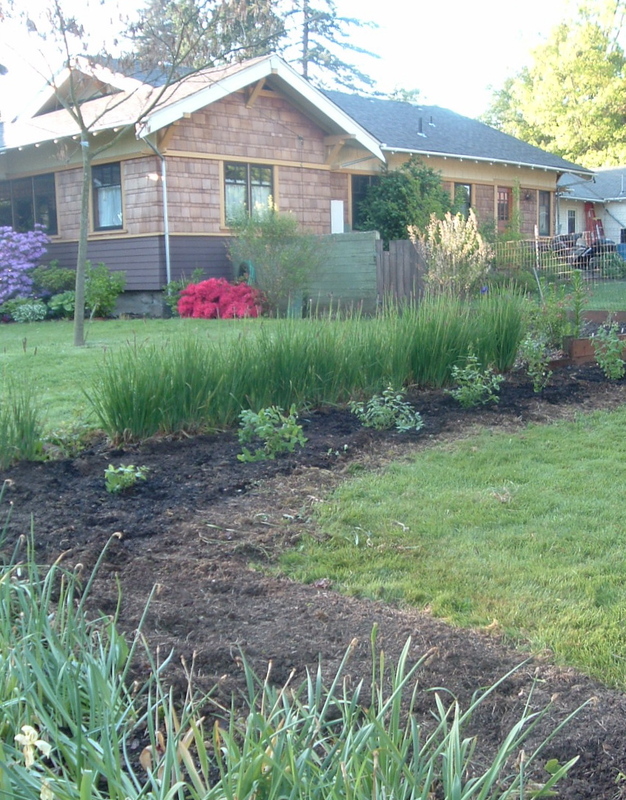 This year, I finally managed to put in a new border at the property line, with the help of my wonderful neighbors (see their restored 1920s farmhouse to the left), who rototilled the lawn and labored with me to amend our Willamette Valley clay with river sand. I now have a hedge, or rather, a hedge to be. 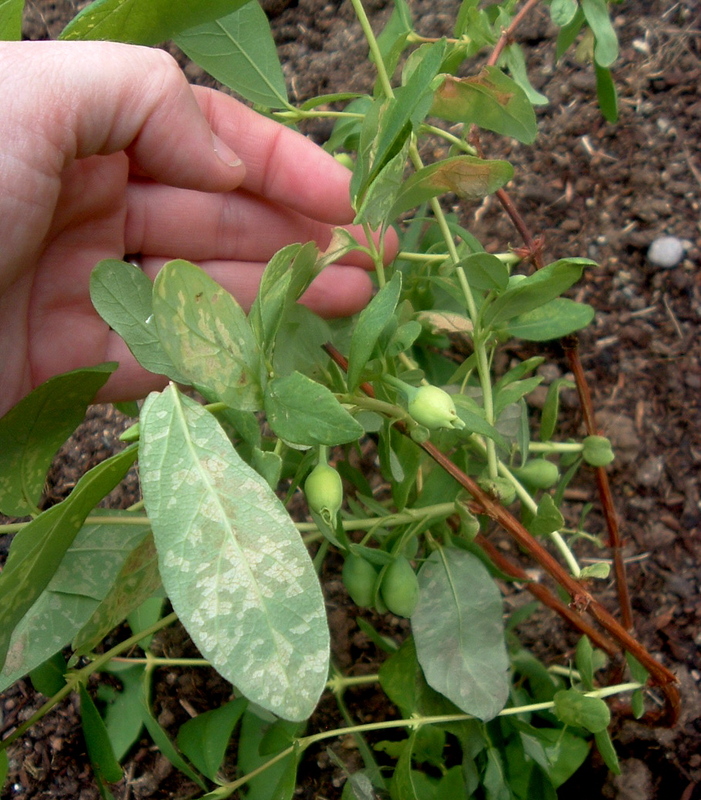 The plants are an OSU-developed cultivar of the Japanese strain of the haskap berry or blue honeysuckle, part of a western U. S. trial for a viable commercial crop. The plants were suddenly made available to Master Gardeners just before I left for Buffalo, so they were languishing in pots over a month and now look a bit beat up and munched as insect salad. Keep your fingers crossed for me, please. In other garden news, I have almost all my rows planted, with the exception of beans and my late summer vegetables: peppers, basil, squash. I’m still working on building the pepper bed. 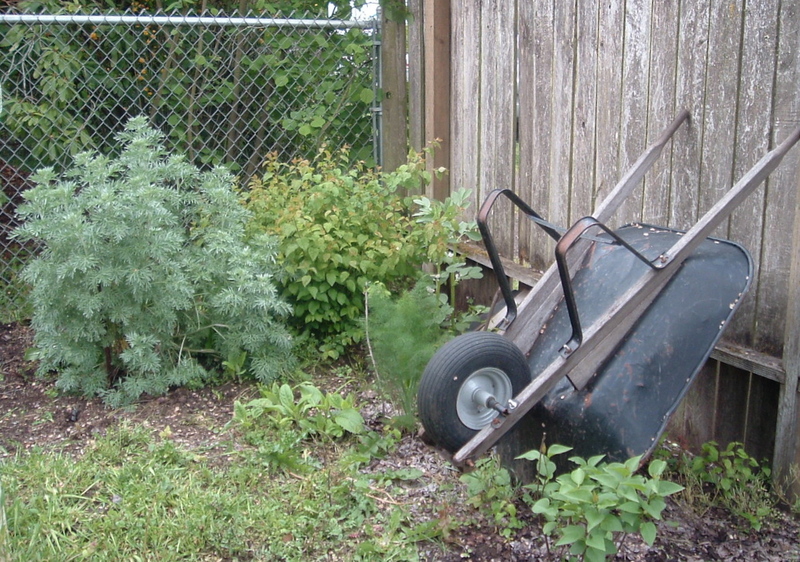 The tomatoes, cabbages, potatoes, and other vegetables and herbs are weathering the weather. I collected leek and garlic scapes this morning. I’m pretty sure I ruined my grape crop this year, because I pruned back the overgrown vines severely to stimulate growth that’s not six feet high. Planting the vines next to a fence was one of the many brilliant ideas previous owners had to ensure none of the old plantings would ever be healthy. Ugh. 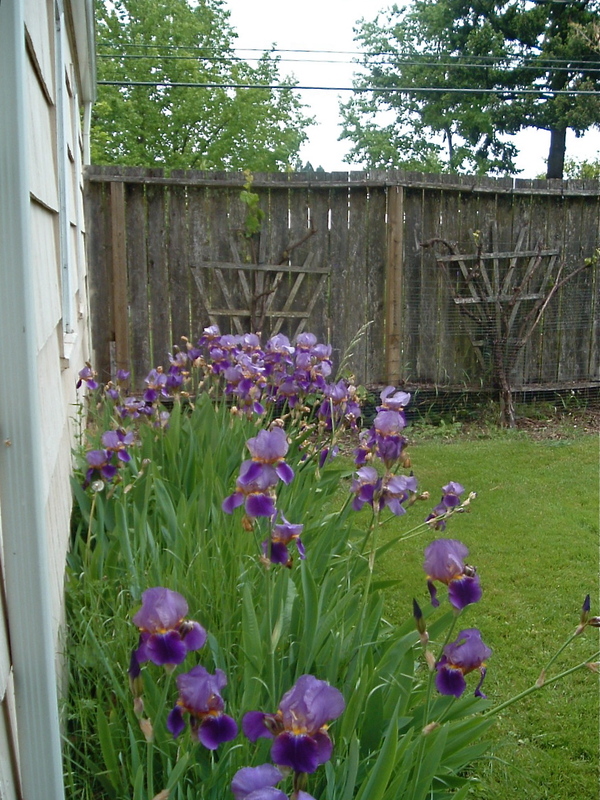 One of my ideas is just to bring out the vines away from the fence in the south, creating an arbor that runs parallel to the house and the overgrown masses of irises that are pretty for, oh, two weeks out of the year. But that’s a project for another time. I managed to strain my back a little, so I need to take it easy for the next week before I go back to Buffalo to finish my fellowship research and attend what promises to be an excellent Joyce conference. Well, “easy.” And I have mucho work to do inside, as you might imagine. I needed a break. Now that my brain has relaxed a bit and I’m not sleepless with anxiety and almost psychotic with heavily detail-oriented editing and research, I think I can actually do it. You know, I could almost live with this flip-flopping of brain and brawn projects. There are worse things you could do in an Oregon summer. Need a new canner? Please join me at a demonstration of basic waterbath canning techniques at Down To Earth (Olive & 5th) this Saturday, May 23, from 1-3. 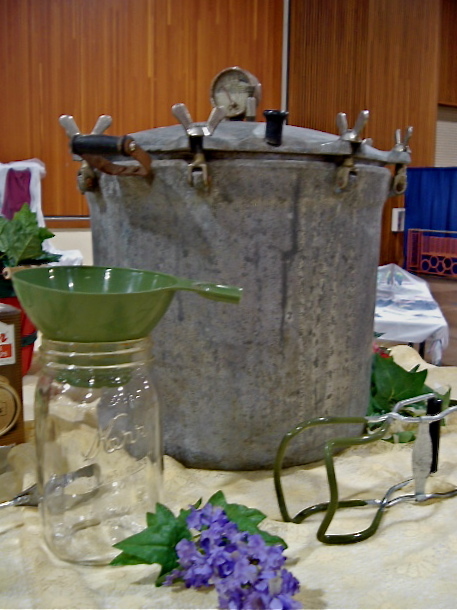 This will be the first of several in a series of preservation demos presented by the OSU Extension – Lane County Master Food Preservers and hosted at Down to Earth’s flagship store. Even if you’re an experienced canner, please stop by to say hello and help yourself to the delicious samples, recipes and hand-outs developed by the Master Food Preservers! Some people love greens, and I’ll pat them on the back. I’m not averse to them, but my regular readers have already heard my groanings. The push to eat superfoods — especially dark, bitter rabbit salad — has made greens a culinary star, and they appear in far more dishes than they should. Our local health food store, for example, has a prepared salads bar, about 99.9999% filled with kale. And it’s served raw. RAW. Patrons circle around it hungrily, twitching their noses and waggling their ears. Worse yet, greens grow really, really well here in the Willamette Valley. A friend once pointed out some overwintered chard in his slightly neglected garden. “Those chard are twenty years old,” he said, “and they keep coming up.” That’s what I’m talking about, my friends. WEED strength greens. And worst of all, greens grow in the salad days of the growing season, coming up thick and lush and the color of deep forest on days when you’re dying for something to cut this morning’s bacon fat and drippings from last night’s roast. They’ve got their PR, their market niche, and their timing down. Greens have a Ph.D. in advertising. So, they are a force to consider. And they’re even tasty, in moderation. So every year I set out to do something new with greens. 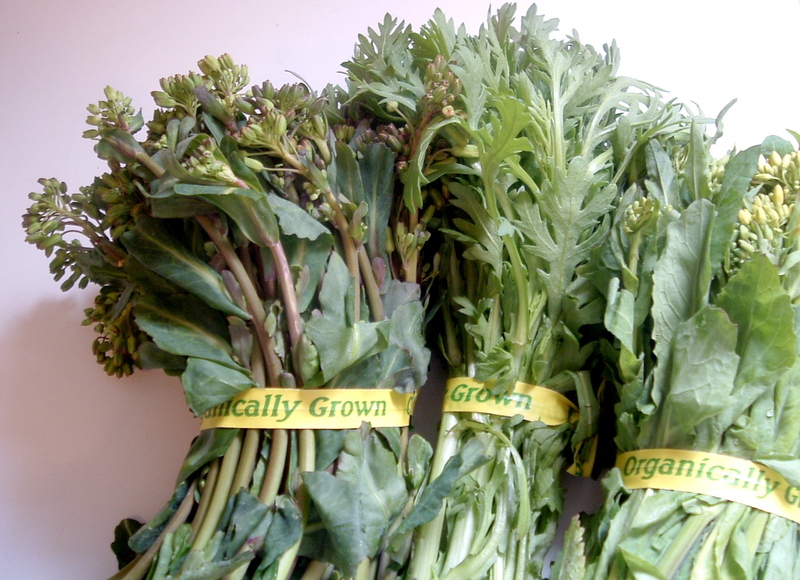 Even I can’t resist the fat, juicy little bundles of raab-style baby greens in the farmers’ markets now. Our local farmers make use of the thinnings from their rows, selling off the shoots to greens-hungry rabbits local foodies. To celebrate their arrival, I started thinking about the recipes one makes with older greens, and recipes one makes with spinach. The best ones are long-cooked and softened with fat, usually smoky ham hock or butter. I thought I could give a nod to the health rabbits and still maintain deliciousness by lightening up one of the long-cooked recipes. One of my favorite ways to eat greens is Ethiopian gomen: a range of dishes made of collard greens that feature niter kibbeh, a clarified butter often made with garlic, fenugreek, ginger, cinnamon, clove, and cumin. The greens are mixed sometimes with cottage cheese, providing a nice contrast of soft mild dairy. Turns out you can make a quick version, too. The dish doesn’t resemble the original product, but it is fresher, lighter, and a yummy dish in its own right. Perfect, I thought, for a spring potluck. 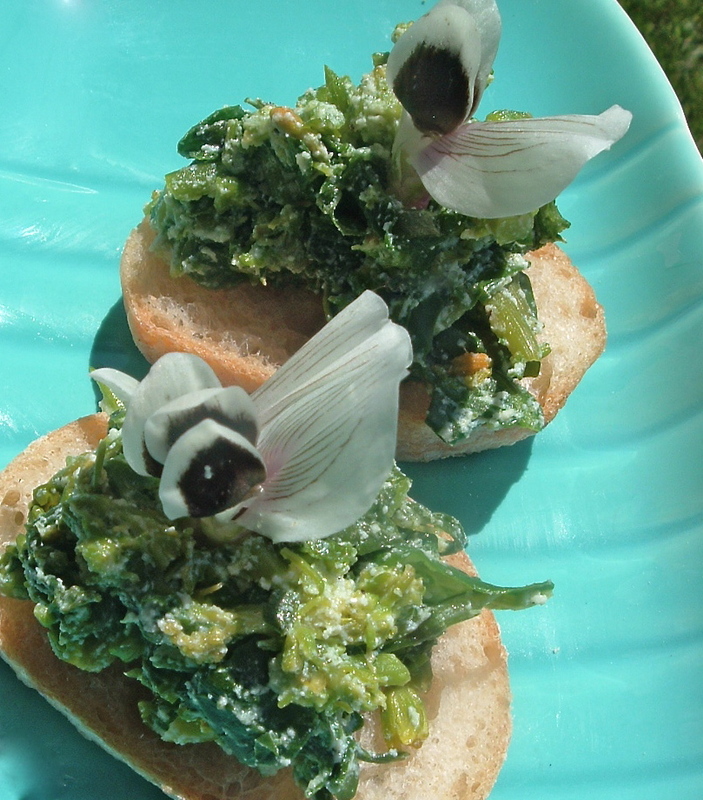 I whipped up my experiment — Ethiopian Greens Bruschetta — as a two-bite appetizer for a recent barbecue with a group of local foodies hosted by Amy and Matt from Our Home Works. The feedback was positive! Upon reflection, I think you could probably make this recipe with a wide range of spices to reflect any spring menu. The amount of clarified butter and salt are also variable, based on your tastes. (I probably use more than you would.) You’ll find the recipe for the niter kibbeh linked in the recipe below. It makes more than you will use for the greens, but the clarified butter keeps well in the refrigerator because the milk solids are removed, and is delicious with potatoes and other recipes calling for plain butter. For the experiment, I purchased the three bundles above: mini brussels sprouts greens, Japanese shungiku, and turnip greens. They cooked down significantly, and I used more of the stems than I would have if they were older greens. I also used a couple of tablespoons-full of whole milk ricotta, because I thought it would add a cottage-cheese-like nuance to reflect the original dish the Ethiopians call gomen kitfo, but I wonder if it just muddied the color and flavor in my quick-cooked version. So the cheese is optional in the final recipe below. This dish can also be served a side without the bread — try the greens with a poached egg on top for a brunch, or alongside some barbecued chicken thighs or ribs. And be sure to eat tons of these greens; they’re good for you. Wash greens well in several changes of water. 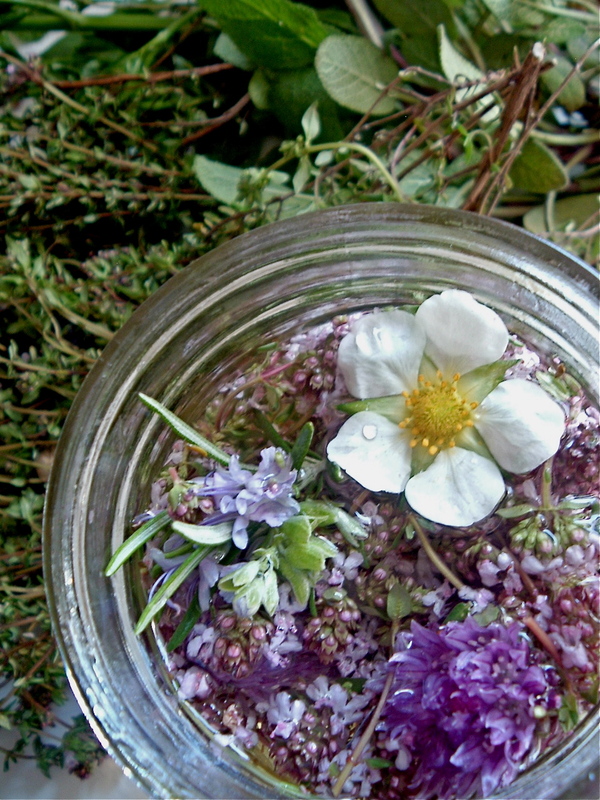 Remove most of the stems, except for the top 2-3 inches. Chop leaves and the top stems finely. Blanch greens by bringing well-salted water to boil in a medium-sized pot, then submerged the greens in the boiling water for about one minute. Immediately remove the limp greens, and place them in a bowl filled with cold water and ice. This will stop the cooking and set the color. Drain greens well and squeeze out as much liquid as possible. Saute the chopped onion in the niter kibbeh until it is just beginning to turn brown. Add the greens and cook briefly, then remove from heat. How long to cook is a matter of taste. If you like your greens crunchy, heat only briefly, but if you like them as I do, more tender, cook for a few more minutes. Remove greens from heat when they are cooked to your liking. If you are using the ricotta/cottage cheese, mix it in now. At this point, the greens can be refrigerated or served. If you refrigerate them, warm them up for 30 seconds in the microwave before serving. Just before serving, toast or grill slices of baguette, then mound 2-3 tablespoons greens atop each slice.